During our second half of the night we headed over to the Atlantic Station area. This was such a fun spot to shoot, and such a great place to show the city! Great idea by Danielle! As you will see it went from light, to twilight, to night really fast! But, we think that we captured that pretty well, and it made for some dramatic images by the end of the night. 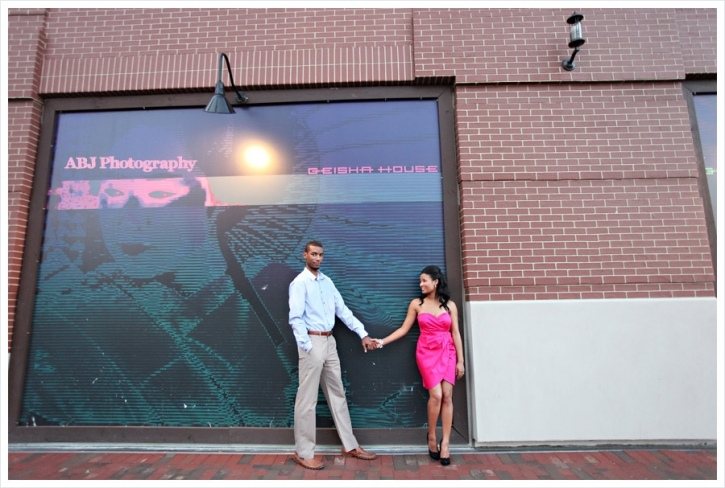 The Geisha House is very special to Charles and Danielle, this is where Charles proposed! We knew that we needed to get some fun shots at this location first! So sweet…and I am not talking about the candy! By the time we reached this part of the shoot we were deep into twilight. We love how the lights from the street and the buildings around us really created a soft and romantic light for us. Thank you, thank you, thank you for SUCH an amazing night! You two are amazing, and we cannot wait to celebrate with you in July!!!! Betty D. Chunn - Hi Danielle & Charles, Your photo’s are amazing I’m so happy for you. I want to see you 50 years from now looking as happy as you are now in these photo’s. God be with you I love you. aka mama Dee. Eliana @ ellyB - Gorgeous couple! Inga Suttle - Hooray! Danielle you found a wonderful photographer to capture the two of you. I can’t say enough how happy I am that God has blessed the two of you to make this commitment. This is all just the beginning! Love you both! Louise Collins - Danielle and Charles, your pictures are simply gorgeous. We’re all looking forward to July. See ya in Atlanta!! !